COMPLETE WATERPROOF: Full Waterproof Not Only String Lights, But Also Power Adapter, and Controller; safe for both Indoors and Outdoors use. 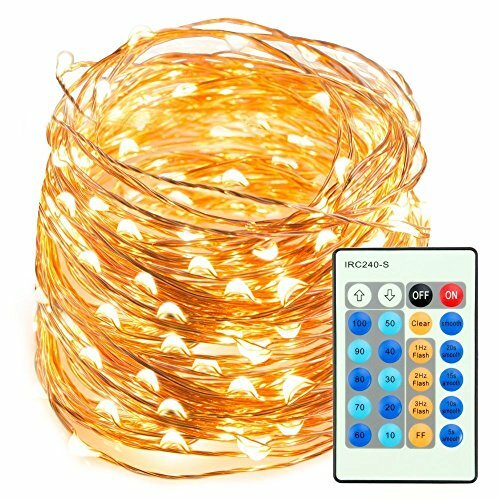 LIGHT UP THE SKY: Super Long 66 ft / 20 m on 200 leds copper wire creates a warm, joyful, and festive ambience to delight your Christmas ,holiday or wedding. Fiber Optic Lights. SMART REMOTE: Control the rope lights remotely with 10 brightness levels and 3 different modes - Smooth / flash / Strobe. Please kindly note that the string light could not be extended or connected together. UL CERTIFIED: High-safety power adapter and controller with short circuit protection to better protect you and starry lights. UL588 and TUVus Approved for Safer usage. Do not apply excessive force or repetitively bend the same spot.